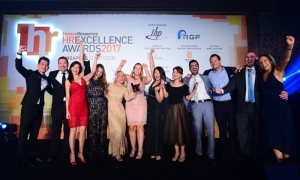 Organised by Human Resources, last night saw senior regional producer Nikita Erpini producing one of Asia’s largest award shows – the HR Excellence 2017 Awards, Singapore. Held at Mandarin Orchard, the awards saw more than 450 HR leaders and industry players celebrating the achievements within the HR profession. Since it’s inauguration in 2013, the HR Excellence Awards has applauded organisations in Asia which has strived for excellence and outstanding human capital strategy and execution. Featuring 24 highly relevant and significant categories, the jury has named Mundipharma as Employer of the Year, with its very own Linda Downs as HR Leader of The Year; as well as Lotte Scheffer from Lazada Group as the Young HR Talent of the Year. In one of its newly-added category, Excellence in HR Change Management; AXA Insurance won gold, followed by PepsiCo India with silver, and SMRT taking home the bronze award. In fact, SMRT also won other wins including Excellence in Compensation & Benefits Strategy with silver (and Dow Chemical Singapore with bronze), as well as Excellence in Talent Management with a gold (where Mundipharma won bronze, and Manulife Business Processing Services won silver). As for Excellence in HR Innovation, the bronze award goes to Schneider Electric India, with DHL Supply Chain Singapore winning a silver, and SAP taking the big gold. Other gold wins for SAP included Excellence in Compensation & Benefits Strategy, and Excellence in Effective use of Social Media – where bronze was given to Manulife Business Processing Services, and silver to Dell Technologies. Additionally, the firm’s Excellence in Innovative use of HR Tech was recognised with a silver win. Talk about Excellence in Innovative use of HR Tech, the award was also given to Schneider Electric (bronze) and Cycle & Carriage Singapore (gold). Moving to Excellence in Cross-border HR Programmes, the award was given to three very deserving wins – Louis Dreyfus Company Asia (bronze), Boehringer Ingelheim ROPU SEASK (silver), and Lazada Group (gold). Next, the Excellence in Workforce Mobility award saw Henkel Singapore winning a bronze, with Thales Solutions Asia taking home silver, and the big gold was awarded to Manulife Business Processing Services. In fact, Manulife Business Processing Services also took home the gold in Excellence in Recruitment – where DKSH won bronze, and Edwards Lifesciences Singapore winning silver. In the next award for Excellence in Employer Branding, Deloitte Singapore was a proud gold winner – having OCBC Bank (bronze) and PepsiCo India (silver) contended in the same category. Not the only win for PepsiCo India, the firm also won in Excellence in Leadership Development with a gold award, while Schroders Singapore and Deloitte Singapore took home bronze and silver respectively in the same category. As for Excellence in Workplace Culture, the bronze award was given to National University Hospital Services Group (NUHSG), followed by AXA Insurance with silver, and United Overseas Bank with a gold. Meanwhile, a gold win was given to OCBC Bank for Excellence in Learning & Development (where CrimsonLogic won bronze, and Thales Solutions Asia won silver); as well as the award for Excellence in Graduate Recruitment & Development. In the latter category, Bank Mandiri took home bronze, and BNP Paribas with silver. On to the next award, the Excellence in Workplace Wellbeing awarded Royal Bank of Scotland with a bronze win, while Agri-Food & Veterinary Authority won silver, and Schneider Electric India named the gold winner. Among a number of closely-contested categories was Excellence in Employee Engagement with bronze awarded to Agri-Food & Veterinary Authority, silver to SPRING Singapore, and gold to DBS Bank. Meanwhile, the Excellence in Work-Life Balance went to Metro Pacific Investments (bronze), GroupM Media India (silver), and Food Playground (gold). Next up on Excellence in Employee Healthcare, Edwards Lifesciences Singapore took home bronze, while Metro Pacific Investments had a great silver win, with Fuji Xerox Singapore bringing home the gold. Taking pride in its CSR efforts, ACCORHOTELS ASIA PACIFIC (bronze), United Overseas Bank (silver) and Deloitte Singapore (gold) were awarded the Excellence in CSR Strategy. Moving to some of the best D&I initiatives, we definitely couldn’t miss out on PwC Singapore (bronze), AIG Asia Pacific Insurance (silver), and Dell Technologies (gold) for their Excellence in Diversity & Inclusion. Meanwhile, the Excellence in Mature Workforce Programmes award was given to Shangri-La Hotel Singapore (bronze), ACCORHOTELS ASIA PACIFIC (silver), and Certis CISCO Security (gold). With that, Human Resources would like to give special thanks to our silver sponsors – IHP and RGF for making the awards a true success.